Rising Star Eliot Rahal & Acclaimed Artist Khari Evans Officiate Bloodshot’s Silver Anniversary with a Standalone Summer Special! 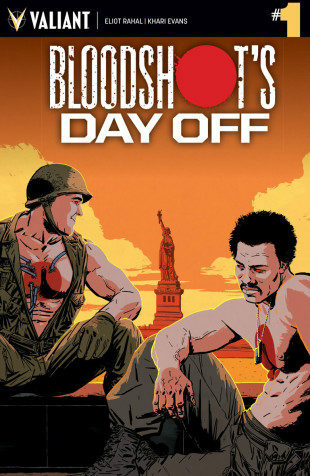 Get ready to pop the top off a cold one and lather on the sunscreen because, this summer, the hottest stop in the Valiant Universe is BLOODSHOT’S DAY OFF! As revealed today at Comic Book Resources, Valiant is proud to announce BLOODSHOT’S DAY OFF #1 – a standalone one-shot special celebrating 25 years of Valiant’s hard-coded commando from rising star Eliot Rahal(Divinity III: Escape from Gulag 396) and explosive artist Khari Evans (Harbinger, Harley Quinn)! On July 5th, the Bloodshot Squad rockets out of the pages of BLOODSHOT REBORN and onto the streets of Manhattan for some hard-earned R&R in Valiant’s next special issue commemorating the greatest Valiant tales of past and present with an action-packed tribute to the original Bloodshot #12! On July 5th, two of Valiant’s most hardened veterans rotate back to the civilian life…and get thrown into the fight of their careers! This summer, Eliot Rahal and Khari Evans set the Big Apple’s deadliest tourist trap yet in Valiant’s final celebratory special of the summer, only in BLOODSHOT’S DAY OFF #1 – featuring covers by Kano (Swamp Thing), Khari Evans (Ninjak), Ben Tiesma (TMNT: Bebop & Rocksteady Destroy Everything), and Renato Guedes (Bloodshot Reborn)! Plus: On May 10th, take up arms alongside New York Times best-selling writer Robert Venditti (Hal Jordan & The Green Lantern Corps.) and acclaimed artist Renato Guedes(Bloodshot Reborn, Wolverine) as they unleash ETERNAL WARRIOR: AWAKENING #1 – the second of four special issues honoring the most beloved Valiant stories ever told with an astonishing standalone tale torn from Gilad Anni-Padda’s long march through the ages. Then: On June 14th, traverse the long and storied history behind the rise of Earth’s most formidable heroes with multiple Harvey Award nominee Rafer Roberts (Harbinger Renegade) and acclaimed artist Francis Portela (Faith) for RAI: THE HISTORY OF THE VALIANT UNIVERSE #1 – an astonishing standalone tale revealing the saga behind Valiant’s greatest heroes and villains! From the prehistoric ruins of Babylon to the far reaches of the 41st century, salute 25 years of Rai’s place at the apex of Valiant’s reach across the ages right here…and enter a jam-packed, centuries-spanning jumping-on point for the largest independent superhero universe in comics! For more information, visit Valiant on Facebook, Twitter, Tumblr, Instagram, and ValiantUniverse.com..